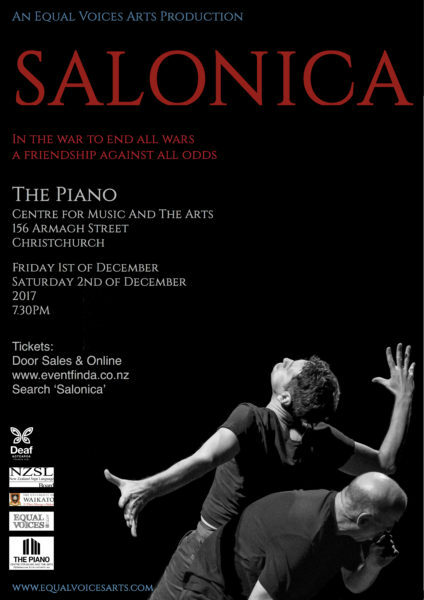 Thanks to the NZSL Fund and the University of Waikato, we are bringing Salonica to Christchurch in December. An original physical theatre production exploring a friendship across cultures against the back drop of World War 1. 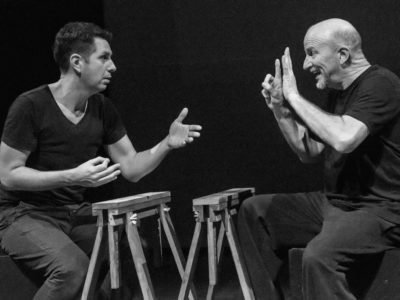 Performed in New Zealand Sign Language, English and Serbian. Accessible for both Deaf and hearing audiences. CHRISTCHURCH performances: 1st/2nd December 2017. Christchurch information in NZSL here. Where? The Piano Centre for Music and Arts, 156 Armagh Street , Christchurch. In 1916 a great multi-national mass of humanity descended on the ancient city of Salonica. Refugees and soldiers created a vast tented city. Hospital ships lay off in the harbour, as a wall of barbed wire was erected. In the lull in the fighting between Christmas 1916 and Easter 1917, two soldiers strike up an unlikely friendship: a Serbian soldier fresh from mountain combat and a Kiwi sapper, survivor of Gallipoli, who has concealed his Deafness to join up, meet. With no shared language they develop a way of communicating through their everyday joys, sorrows and letters home.